"In late 2008 British artist Roger Hiorn created an artwork out of an entire apartment in South London by filling it to the ceiling with a strong copper sulphate solution, waiting for crystals to form, then pumping the solution out again. The result, called ‘Seizure’, was stunning and alien. Sadly, it is no longer accessible to the public and the buildings will eventually be demolished, but it has been photographed by special arrangement. This is one of the resulting panoramas..."
Seizure, the work, a result of a chemical process involving 75,000 litres of copper being pumped into a flat to create crystalline growth on the walls. The £1 million work was commissioned by Jerwood/Artangel Open, in partnership with Arts Council England and Channel 4. 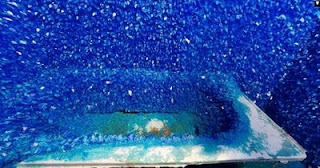 According to Artangel, the artist 'makes exceptional use of unlikely materials: detergent, disinfectant, perfume, fire and copper sulphate crystals'.